Place pear halves, cut sides up, in a 13×9- inch baking dish. Combine oats, wheat germ, almonds, honey and butter in a medium bowl until thoroughly coated. You can add a little more melted butter or coconut oil if needed. Spoon oat mixture evenly into pear halves. 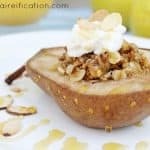 Bake 20 to 25 minutes or until pears are tender and topping is golden brown.